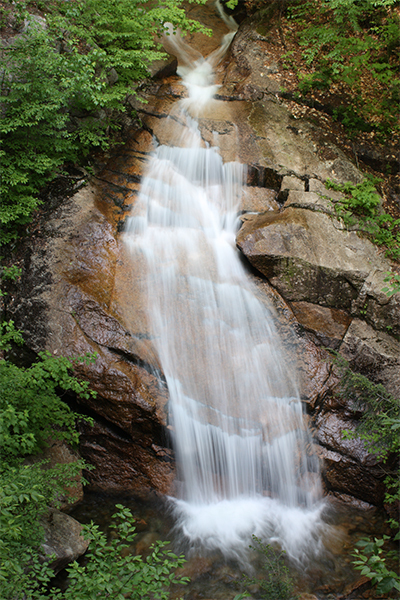 This just may be the most popular waterfall hike in New England. 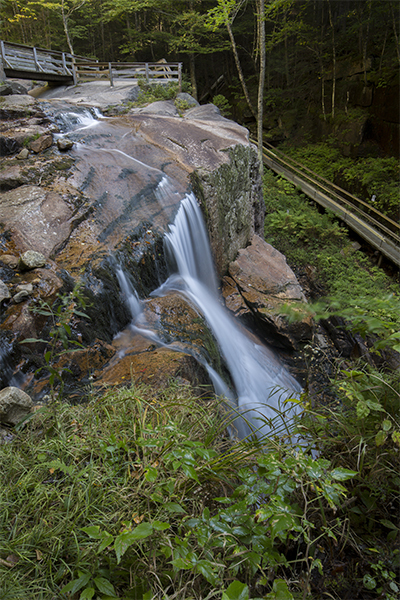 A trip to the Flume-Pool Loop, or The Flume as it is known to so many, has long been a favorite for families, hikers, photographers, and sightseers. This is no surprise really, considering the variety of natural features offered on the 2-mile loop trail. Along the way you will get your daily dose of waterfalls, covered bridges, glacial boulders, a long flume, and one of the deepest pools below a waterfall in the region. The first waterfall you visit, Table Rock, is more of a slide than a waterfall. 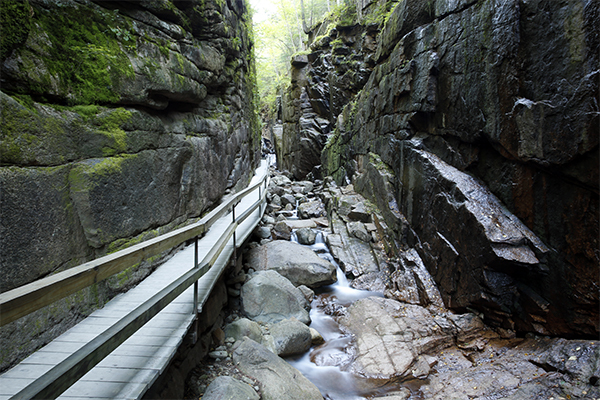 At Table Rock, granite has been weathered by Flume Brook for thousands of years. This waterslide is quite large: about 500 feet long and 75 feet wide. 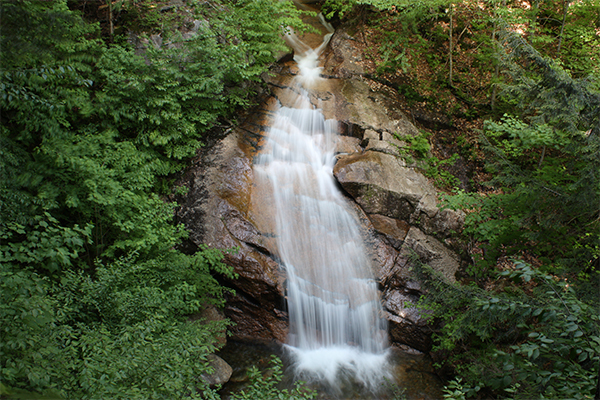 The next falls is Avalanche Falls, located at mile 0.7 of the trip and the near the end of the boardwalk within the Flume Gorge. The falls was supposedly formed during the great storm of 1883. This waterfall is a major highlight of the hike, and can therefore be extremely crowded. It can be difficult to snap photographs of the falls without fellow visitors in the frame. You may be hurried along the boardwalk trail due to the flow of the crowds, unless you arrive early in the day or come on the offseason. To beat some of the crowds, continue hiking to the top of the falls, where you can enjoy a birds-eye view of this 45-foot tall plunge. 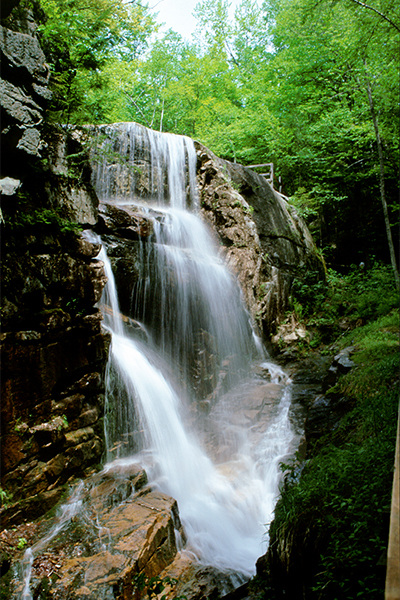 After Avalanche Falls, continue along the loop to a short spur trail that leads to a view of Liberty Cascade. This waterfall is a 70-foot clear-water horsetail. Considerably sunnier than its nearby neighbor, Liberty Cascade is perfect for photographs. The gorge is highly exposed to the sun and although there is only one viewpoint of the falls from an observation platform, you really should not miss this. It is perhaps the prettiest of all the waterfalls here. The final scenic wonder of the trip is called “The Pool.” Very large in size, 40 feet deep, and 150 feet in diameter, The Pool is located in a deep basin of the Pemigewasset River. Viewpoints from the trail extend around the pool, offering just about every perspective possible. If swimming were allowed, this pool would be one of the top swimming holes in New England. However, The Pool is off-limits, probably due to both the intense popularity of the loop, and to the difficulty one would have entering and exiting. Take note that pets are not permitted on this hike. 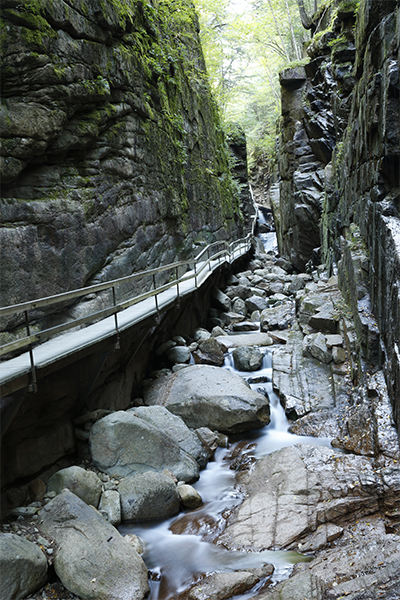 Opportunities for recreation with your pets within Franconia Notch State Park is nearly limitless, though, and some trips begin right from The Flume's parking area. 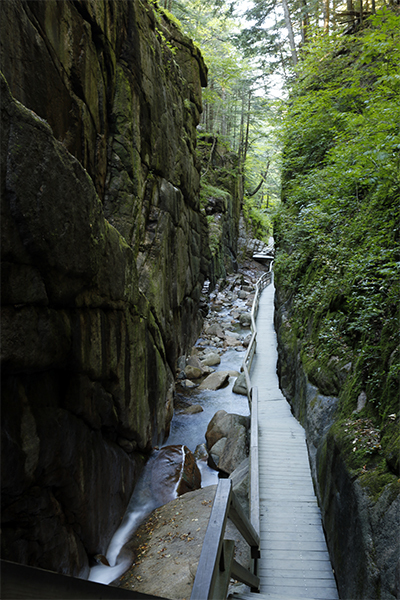 Accessible right from the parking lot is the paved 8.8-mile Franconia Notch Recreation Path and a moderately difficult 3.2-mile round-trip hike to fine views from ledges on Mt. Pemigewasset. Both of these outdoor adventures are highly recommended.